There are so many areas of life where we do things without even thinking about it. They become an assumed part of our life, and so we never question it, nor realize there are alternatives. This can be true for almost anything, from our diets, to our clothing, to something as small as how we do our laundry and what we use when we do it. As I would assume is true for many families (especially in North America, I'm not sure what is used in other countries), dryer sheets are a laundry essential. Growing up, I always saw my mother throw in two dryer sheets with a load of laundry. Naturally, I didn't question this. When I moved out, I picked up the same habit. Two dryer sheets with each load. Needless to say, we went through a lot of dryer sheets. While at the natural foods store, I noticed a product in passing: reusable dryer sheets. That was such a strange concept to me. How could that even work? The packaging boasted that it lasted for 100's of loads. So the next time we went to our regular grocery store to stock up on the essentials, and I was picking up dryer sheets, I stopped to think. I noticed the price of the package of dryer sheets I had always grabbed without question was $12. It would last us about 4 months. The reusable ones I had seen before had also been $12, but lasted for 100's of loads. It was a no-brainer for me. Not only was it more economical, but it was also better for the environment. So I switched over to the reusable dryer sheets, somewhat skeptical about how well they would work, and fully prepared to return them to the grocery store if they didn't. Much to my surprise, I discovered that they worked better than the throw-away dryer sheets! What does this have to do with dryer balls? Not to worry, I'm getting to it. So I became quite happy with my new laundry system. 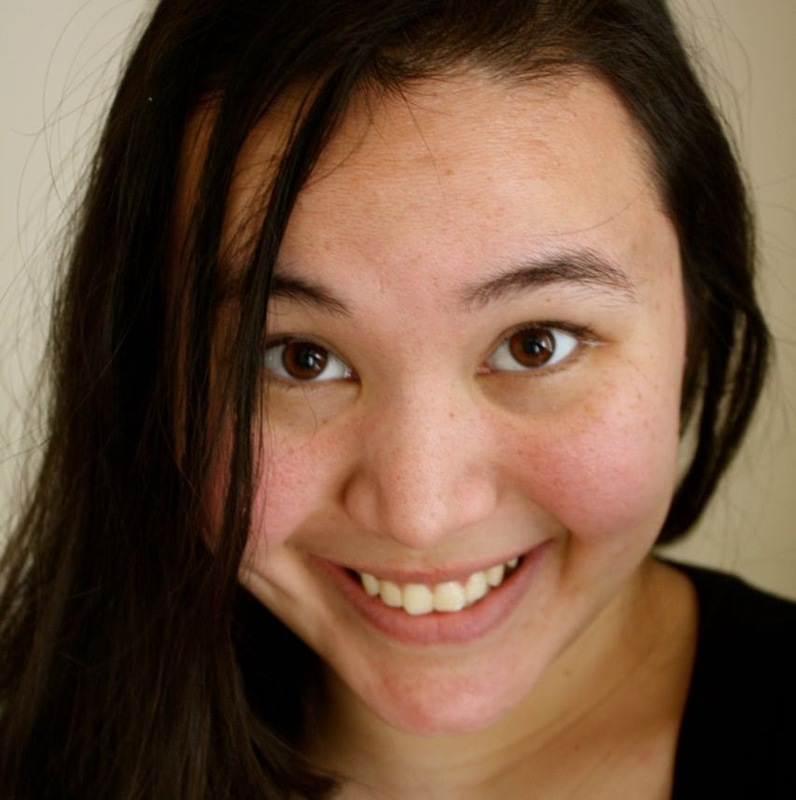 The reusable dryer sheets worked well, and I also enjoyed that they were truly unscented. While we had always purchased unscented disposable dryer sheets, they seemed to pick up and retain a bit from just sitting on the same shelf as the scented ones! I didn't really think my laundry system could get any better. But then I heart about Woolzies dryer balls. I've seen quite a few dryer balls around recently. I had to find out what all the fuss was about. 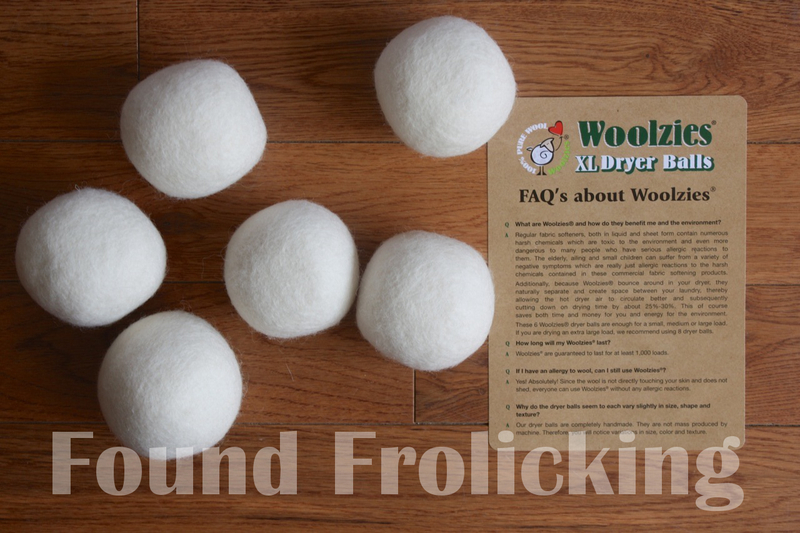 I was provided with one package of Woolzies dryer balls to review. In the packaging, there are 6 XL dryer balls. Unlike anything else on the market (disposable or otherwise), Woolzies last for 1000's of loads. That's right, you saw the correct amount of zeros. Thousands. 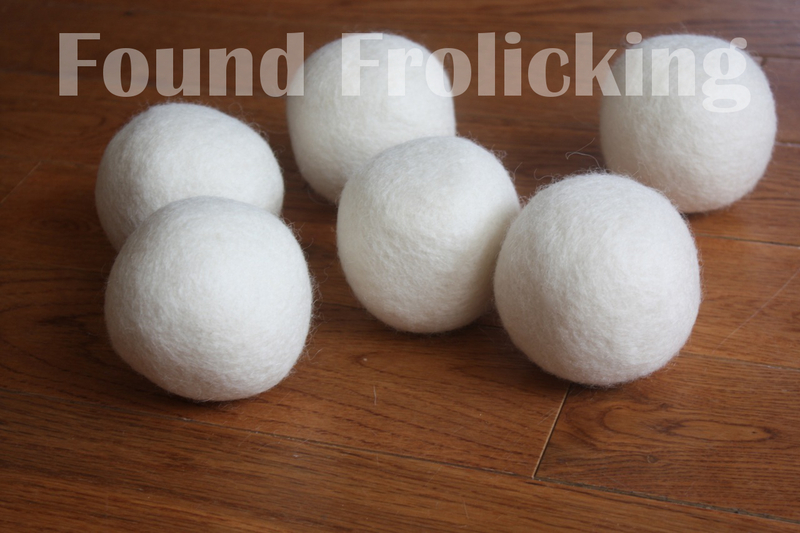 I've looked at quite a few disposable dryer sheet alternatives since switching over to reusable dryer sheets, and nothing comes close to having the lifespan of wool dryer balls! The price tag can seem kind of ridiculous. $35 for a box of wool? But considering the cost of disposable dryer sheets, it would cost an average of $48 for approximately 2,000 dryer sheets. So Woolzies actually save you money. I've been using my Woolzies for about 3 months now. And they are definitely my new go-to dryer item. They work very well, and I quite enjoy seeing these adorable, fluffy little balls when I open up the dryer. Another benefit to dryer balls? You can scent them yourself. You can take any essential oil (or multiple oils! ), and put a few drops onto a dryer ball. Then throw them in with your laundry as usual, and they will smell amazing when your clothes are dry! While most artificial scents give me grief, I've never had trouble with essential oils. My favorite way to scent my laundry is using sweet almond essential oil. During my use of Woolzies, I have definitely observed a few things about these nifty little products. Pros: 1. Easy to use. 2. Saves time (of going to the grocery store to pick up disposable dryer sheets every few months). 3. Saves money. 4. Good for the environment. 5. Because the Woolzies have some weight to them, when pulling laundry out of the dryer a few at a time, they will almost always drop to the bottom of your dryer. Which is much more convenient than finding hitch-hiking dryer sheets clinging to your clothes. 6. Can be naturally scented, or left unscented for those who are more sensitive. 7. They can be conveniently left in your dryer at all times, so you don't even have to remember to put them in with each load. 8. Because of the size and shape, if you end up having a hitch-hiking one, you can easily feel around in your laundry to locate it and throw it back into the dryer. 9. Naturally softens laundry. 10. Can be re-purposed when their lifespan has finally ended! Cons: 1. Due to the weight of Woolzies, they can be inconvenient for use with small loads. Because you will here them being spun around and then dropping, which may be too noisy for some. 2. Occasionally one dryer ball will work its way into a pant leg or some place else, and so you have to be watchful of how many are in the bottom of your dryer when pulling your laundry out, since it is not nice to drop one of them on the floor and put it back into your dryer! All in all, there are very few drawbacks to using Woolzies in comparison with the many advantages I have found. You can find out even more about Woolzies, and purchase a box (you might like to know that they ship worldwide! 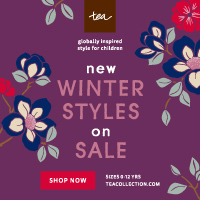 ), visit their website by clicking here. You can also support and follow them by "Liking" their Facebook page, and follow them on Twitter. You also have a chance to find that out how amazing they are by winning some Woolzies. 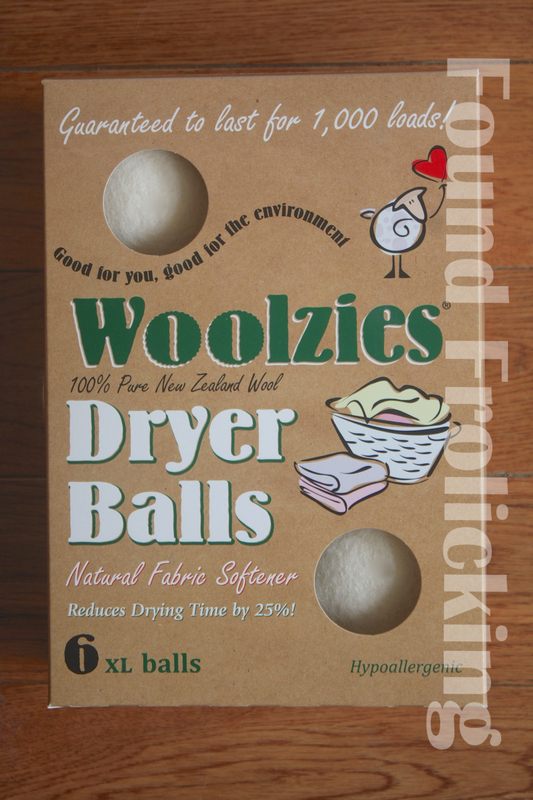 Woolzies is giving one package of dryer balls to one of my lucky readers! Enter below using the Giveaway Tools form. Open to readers worldwide. Good luck! Fine Print for Giveaway: Giveaway open to residents worldwide. Please make sure your email address is correct, so that you can be reached if you win. If the email bounces back, winner forfeits the prize and a new winner will be selected. The winner will have 48 hours to respond to the email sent out to them, and should a response not be received within that time, they forfeit the prize. Please follow the instructions for each entry, as you have to have done what was instructed for your entry to count. All entries will be verified. Found Frolicking is in no way responsible for recipient receiving their prize, but will work with the sponsor in all ways possible to ensure the winner receives their prize. I learned that they are hypo allergenic and good for people with sensitive skin. This is good for me - I have eczema. I learned Woolzies are good for 1,000 loads. Guaranteed to last 1000 loads! 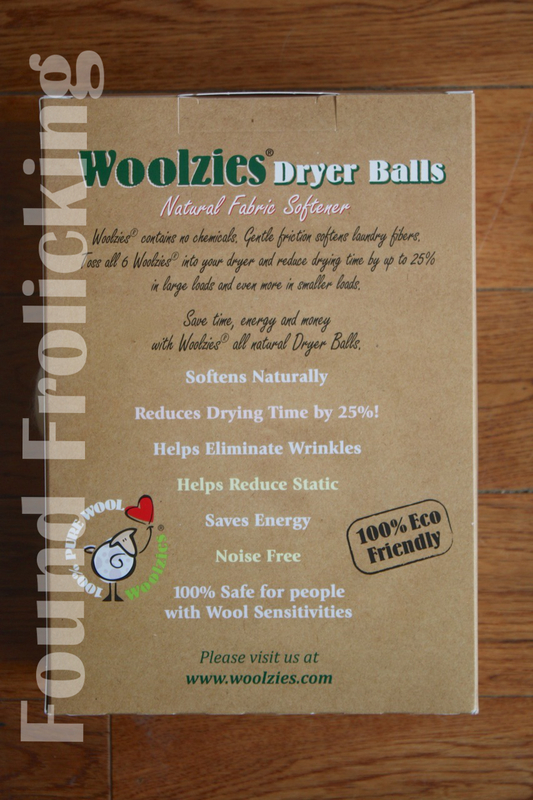 Woolzies save time and energy by cutting down on drying time by an average of 25% per load.